A recent assignment of mine at Journalism School involved finding, and writing about, the themes of some classic fairy-tales. 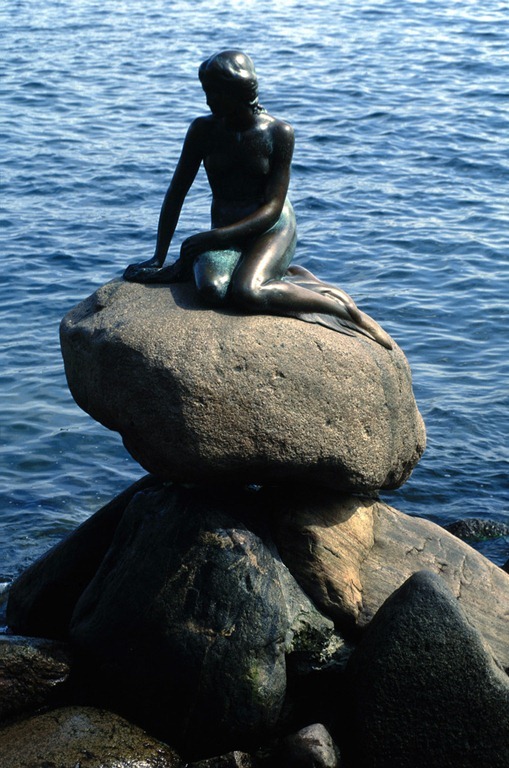 The Little Mermaid by Hans Christian Andersen was one I chose, and unlike the Disney version, where the ending is happy, the original version has a darker, perhaps truer message, that not everyone has the happily ever after. In the story, the Mermaid falls in love with an earthly Prince. Her love for him is so great, and her desire to be with him so strong, that she is willing to make a deal with the devil, or in this case, the Sea Witch. The Mermaid has the most exquisite voice in the sea, and in exchange for her tongue, she will be given a potion. As she drinks this, it will feel as if a sword is passing through her being, but out of this, she will have human legs, to be able to be with her Prince. Without her tongue, she will obviously be mute, but she will be able to dance for him. Even in this though, she will experience excruciating pain, like treading on knives. As if the deal didn’t cost her enough, there was another final condition, which is that if her Prince falls in love with and marries someone else, her heart will break and she will lose her life, turning into the foam of the sea. And this end is how the story goes. There is something in the tragedy of this, that breaks my heart. I don’t like sad endings. It’s not the sadness of the ending that I wanted to focus on though as much as what the story says about her love for her Prince. I’m currently working on a novel, and have also written several journals for a second fictional book, both of which consider desire, our search for love, and the price we are willing to pay, particularly as women, for love. I ask the question in both, is God truly enough to satisfy our desire whether we find romantic love or not? We say that He is, we know the Scriptures that say He will satiate our deepest hunger, but is this experience truly borne out in us? And what if it’s not? What happens if we seek love apart from Him and His will? There is so much that we can see in this fairy-tale about the desire for love, and for me there is such a parallel to what I’ve just mentioned about seeking out love apart from Him. The Mermaid, a Princess of the Sea, who leaves her Kingdom, in search of love outside. In this, she loses her identity, reflected in her muteness, and lives quite literally as a fish out of water, never fully at ease in his world, because she is of another, reflected in the pain she lives with by walking, as a constant companion in her love for him. ~ by Birgit on April 11, 2011. I have always loved that story although I admit the Disney version feels better and I’d rather watch that fairytale ending than the real one. But isn’t the real one much like our own lives? There really is no fairytale ending; or beginning even. We fall in love with and marry individuals that are broken and flawed just like us and we continue to see unconditional love and expecting them to meet our deepest needs when only God can. I know that only God can meet those needs but trying to reconcile that with every day life is so difficult. I continually ask God to show me what the physically looks like. Birgit, I’m such a sap. Everything makes me cry. I’m a hopeless romantic but there’s always a touch of cynicism involved. I think my best dream, desire … a God-chosen man or nothing. That “perfect” man loves God more than he could ever love me, but I always come in a close second. I’d be satisfied and happy with that because he’ll always be second to me, behind God. The only thing I have difficulty with in my love relationship with God is the “touchy-feely” part. That’s a bit odd because I’m not really touch-feely. After all my blah, blah, blah even though I would like to have my heart’s desire fulfilled it’s my greater desire to fulfill His desire for me – that’s always the better plan. what a brilliant theme and one worth exploring. I believe that life involves decisions that always come with a cost. The hardest path to choose is the one that we are led to believe will bring us the greatest long term joy, whether it be in this life or the next. It is line with a similar theme I have been exploring, the choice between chasing a fantasy or a dream. There are many songs that talk about choices, a famous one being, Stairway to Heaven in the part where it says, “there are two paths you can go by but in the long run, there’s still time to change the road you’re on.” I read part of a book (before I had to return it to the library” about Hans Christian Anderson’s life prior and during his life as a children’s writer. A tortured soul indeed in many respects and most famous children’s books have layers of meaning that explore moral dilemmas life. Can I go on your course Briget!! Look forward to hearing more about how your writing is going. Totally, for me the mermaid is Christ leaving his kingdom and coming to Earth in a pain inflicted human body only to be rejected by the one(s) he came to love. Hi Ayla, I’m like you when it comes to happy endings. I don’t sit easily with hope being completely extinguished. It’s a big part of knowing God I guess, that there is always hope. Hope is His ability to transform a situation, hope in His love, hope for our future. But it’s very true that this doesn’t make our lives any less raw at times. It’s a helpful reminder you make here, about looking to God to meet our deepest need rather than to our spouse or any other relationship. There’s a lot of freedom in this as that expectation is lifted. Hi Hope, I am a complete romantic too, so I really relate. It’s such an interesting point you make here about the physical touch side of things – how God may satisfy our deepest heart need, but what about the need to be held? It’s a question in singleness, but also, and perhaps with more loneliness, for some who are married. It’s a big question in both of books I’m working on as well. I love your final thought here too, that our greatest fulfilment comes in fulfilling His desire. Hi Laree, it’s such a good point you make here about choices, and the difficulty of these at times. Particularly when it is a choice between God’s way, or our own, I find. It’s a big part of the writing process too – to put the characters in places of real conflict, where no choice is easy, but the stakes are high, and to see which way they will go. I found it really interesting what you mentioned here about reading about Hans Christian Andersen’s life. There is such a bitter sadness for me, to some of his stories. I even remember the effect they had on my mother as she read these ones to me as a little girl, compared with the other happily ever after fairy-tales. Such a great perspective on it, Ruth, and I can very much see it from this point of view too. Especially when we read the end of the story, that the Little Mermaid could have preserved her own life at the price of her Prince dying, but she loved him so much that she would rather he live (with the bride he rejected her for) and that she sacrifice her own life. Hi Birgit, reminds us of Shakespeare all over again! I have come to the conclusion that although portraited the ultimate fulfullment, romantic love is temporary – also if that means until “death do us part”…. For Christians, life continues after death and our earthy lives is not always suppose to be a forever happy fairy tale. But fullfilling. Big difference. Our permanent heavenly homes will satisfy every need. For a long long time I was in such a comfort zone with my cosy happy life on earth that I was hardly, if ever, enthusiastic about Heaven. Until I worked though a series about Eternity, and the reality of life away from sin and time. Hi Tina, thanks so much for your thoughts here, and I so agree that the ultimate and most profound expression of love I’ve ever known is in the cross, in Jesus giving up His life for me, and for each of us, when I know how undeserving I am. The magnitude of that love is beyond words for me. Hi Des, thanks so much for your reply here, it’s such a great distinction you make about fleeting ‘happiness’ and the deeper sense of fulfilment, and joy actually, that we experience with God. I remember the effect that your study on eternity, and living with that perspective, had on you, and on Petrus, and it’s inspiring. Hi Rain, thanks for your perspective on this. Like you, I have walked both roads. The thing that I’ve found is that after knowing God, it’s not really possible to embrace a path apart from Him in terms trying to satisfy a deeply felt need our own way. It’s almost as if we’re ‘ruined’ for anything else, because nothing compares with what it is to be with Him, and trusting in Him with what we desire. The experience of His presence, the deep sense of peace, the joy. This purpose that you have to be able to stand before God and to be able to say, ‘I desired You above all God’ is truly beautiful, and something I desire too. A few years back I purchased a compilation of Andersen’s fairy tales with the intention of reading the stories aloud to my children. This I did without any foreknowledge of the contents. We read from cover to cover one story a day. After a few unexpected sad endings we began to start each story with a heightened sense of anticipation. Would this be a happy ending or a tragic one. The kids were always so relieved when it ended favorably. I remember the tears in their eyes when they discovered the ‘truth’ about their beloved Little Mermaid. They kept telling me the story was not done yet, that it had to end differently. Now as I revisit those fairy tale story days in my memory I can see how that talk could have been a spring board to talk about the redeeming God we serve in real life. You have your hands full in addressing the truth of the search for true love. I hope to be able to read your thoughts, it sounds fascinating. I so enjoyed this story of you reading all of Andersen’s fairy tales to your children @ngie, and your responses to these stories. No doubt the memory of these times, and the stories themselves have stayed with your children. The memories of them from childhood have always stayed with me. His stories seemed to be so unlike any other, and so evocative, particularly those with the sad endings. I still remember how heart-breaking I found The Little Match Girl. It’s a great point you make about revisiting stories we read in light of our faith. This was obviously very much on my mind with this post. It reminds me of when I was at college, and we had a paper in Theological Reflection on different aspects of culture including books, music and movies. Yes, I’m so enjoying the whole process of writing about the search for love, and am very dependent on God in this. These books are very much works in progress, and I’m really excited about how they’re emerging.